The Islanders were clinging to their one-goal lead in the third period of Sunday’s 2-1 win over the Wild when center Mathew Barzal got tangled along the boards with Minnesota’s Joel Eriksson Ek. 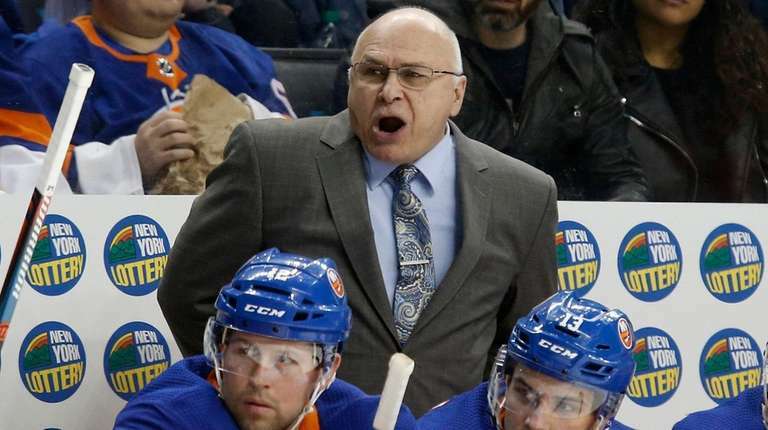 A frustrated Barzal retaliated by striking out at Eriksson Ek and was called for roughing at 8:29, leaving coach Barry Trotz none too happy. Thomas Greiss made five saves during the Wild’s power play, including two back-to-back on Eric Staal during a scramble at the Islanders’ crease. The Islanders’ power play went 1-for-6, with rookie defenseman Devon Toews getting the winner on the man advantage at 2:01 of the second period. Trotz started his second unit, also including Valtteri Filppula, defenseman Ryan Pulock, Josh Bailey and Anthony Beauvillier, for that power play and the Islanders’ previous one. The first unit of Barzal, Anders Lee, Brock Nelson, Jordan Eberle and defenseman Nick Leddy managed only two shots on the Islanders’ first two power plays. RW Cal Clutterbuck missed his second straight game with an unspecified injury that forced him to exit Thursday’s 2-1 shootout win at New Jersey in the second period … President and general manager Lou Lamoriello was spotted chatting in his suite with Maple Leafs GM Kyle Dubas, who succeeded Lamoriello in Toronto … Pulock has a three-game point streak, matching his season high … D Luca Sbisa and LW Ross Johnston remained the healthy scratches.